PublicAdCampaign is proud to announce the world premier of the documentary film This Space Available. This full length feature focuses on the issue of visual pollution in our global community. Intent on creating a critical dialogue on the issue, the film investigates a wide range of perspectives including those of billboard executives, government agencies, and public space activists like myself. While the film will eventually be widely available, DOC NYC will be premiering the film on Saturday November 5th at 7pm at the IFC theater in New York City. There will also be a Q&A after the screening for viewers to question the film makers and a few of the subjects. We hope to see you there. 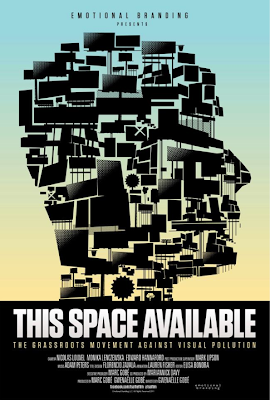 To purchase tickets for the This Space Available premier at the DOC NYC fest at the IFC theater on 11-05-11, please visit the DOC NYC website [HERE]. Remember there is limited space available so get your tickets now before they are all gone. Gobé offers a canny generational analysis of visual pollution, laying blame not just with the advertising juggernaut but also an entire generation of Baby Boomers, whose consumption-based culture has implicated them in the environmental fallout. She argues that it’s her generation, left to do the cleaning up, that is now leading the fight back. But the filmmaker also recognizes the history and politics behind this fight. Turning to such legislation as the Highway Beautification Act of 1965, Gobé shows how the enforcement of this landmark law, designed to regulate outdoor advertising on America’s roadways, has steadily eroded. And today, public space activist Jordan Seiler faces harsh penalties for covering illegal outdoor ads with art, while officials turn a blind eye to illegally erected billboards. Still, the film strikes a hopeful tone. A standout interview features Gilberto Kassab, the popular mayor of Sao Paulo, who threw a stone into the quiet pond of the billboard industry by successfully banning outdoor media in his city – the eighth largest in the world. The move is not without precedent: Houston’s 1980 billboard ban was also a deliberate tactic to improve its flagging image, economic competitiveness, and quality of life.